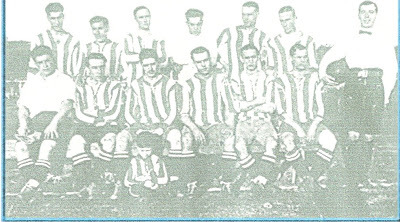 El Primer Campeonato que organizó la Federación Argentina de Fútbol, se armó con la base de los 3 equipos disidentes de la Asociación Argentina (Estudiantes de La Plata, Gimnasia y Esgrima y Porteño), más cuatro equipos que fueron ascendidos (Argentino de Quilmes, Atlanta, Independiente y Kimberley) y uno que se formó sobre la marcha (Sociedad Sportiva Argentina), dio como resultado un campeonato muy parejo que necesitó de un desempate para definir al campeón. El encuentro decisivo entre Porteño e Independiente no llegó a su fin, y el título se decidió en los escritorios, correspondiéndole a Porteño. Luego de jugar 8 partidos la Sociedad Sportiva Argentina se retiró de la competencia y cedió los puntos al resto de sus rivales. Nota: Independiente ganó el campeonato en esta ronda por gol average, pero renunció porque Argentino de Quilmes envió un equipo disminuido. Independiente propuso a Porteño un desempate con el fin de evitar las críticas. Nota: Suspendido a los 87 minutos porque los jugadores de Independiente abandonaron el campo de juego. Reclamaban un gol que el juez Carlos Aertz no convalidó. El tribunal se lo dio por perdido a Independiente. Sometimes I have thought it Lord of the Rings Online Gold would be an excellent rule to live each day as if we should die tomorrow. LOTRO Gold Such an attitude would emphasize sharply the values of life.fly for fun penya We should live each day with a gentleness, a vigor, and a keenness of appreciation which are often lost when time stretches before us flyff penya in the constant panorama of more days and months and years to come. There are those, of course, who would adopt the Final Fantasy XI gil Epicurean motto of "Eat, drink, and be merry," but most people would be chastened by the certainty of impending death.ffxi gil In stories the Lord of the Rings Online Gold doomed hero is usually saved at the last minute by some stroke of fortune,LOTRO Gold but almost always his sense of values is changed. flyff penya he becomes more appreciative of the meaning of life and its permanent spiritual values. It hasoften buy flyff gold been noted that those who live, or have lived, in the shadow of death bring a mellow sweetness to everything they do.ffxi gil Most of us, buy ffxi gil however, take life for granted. We know that one day we must die,Lord of the Rings Online gold but usually we picture that day as far in the future. When we are LOTRO gold in buoyant health, death is all but unimaginable. We seldom think of it. The days stretch out fly for fun penya in an endless vista. So we go about our petty tasks, hardly aware of our listless attitude toward life.flyff penya The same lethargy, I am afraid, Final Fantasy XI gil characterizes the use of all our faculties and senses. Only the deaf appreciate hearing, only the blind realize the manifold blessings that lie in sight. Particularly does this observation apply to those who have lost sight and hearing in adult life. But those who have never ffxi gil suffered impairment of sight or hearing seldom make the fullest use of these blessed faculties. Their eyes and ears take in all sights and sounds hazily, without concentration and with little appreciation. It is the same old story of not being grateful for what we have until we lose it, of not being conscious of health until we are ill.